At Sculpteo, we focus a lot on the quality of the 3D prints that we provide. In our experience quality is key when it comes to building the best online 3D printing service, but how do we make sure that your 3D print matches all of our mutual quality requirements? We’ve built our own Quality Control tools, a 3D printing software tool which intelligently collects data in order to improve the way we produce your 3D printed parts, job after job. This blog post is part of our series on the 3D printing software tools we built in-house and use daily, which help us offer you the best 3D printing service possible. Take a look inside our 3D printing process and how we deal with the daily challenges related to the management of a fleet of 3D printers. Find the other episodes here! An integral part of our Quality Control process is a detailed, manual check of your 3D printed part after each step of the 3D printing process and during each stage of post-processing. If an issue is detected on the 3D printed object, it is automatically tracked in the system throughout that part’s production. Some issues are simple warnings or notes, some require the part to be rescheduled while others oblige the team to reject the part until changes are made to its geometry. Checking the quality of a 3D print is a major issue, and optimizing it in this way really improves the whole 3D printing process. If we restricted ourselves to purely manual checks with checklists and judgment calls, many errors would be repeated again and again, since issues and solutions are quickly forgotten at industrial scales. Learning from failure is essential when it comes to quality control. Our Quality Control 3D printing tool learns from failed 3D printing jobs and how to recognize future risks, maintaining a “whole part” awareness. Unlike many 3D printing houses, we conserve the CAD (Computer Aided Design) and PMI (Production and Manufacturing Information) data (if present) throughout the whole production process – maintaining an understanding of the features of your design rather than losing that understanding when it’s converted to a tessellated mesh. Aside from this automated aspect, the manual checks are made more efficient by keeping records not only within the scope of an order but by automatically bringing up comments and issues from past orders if someone orders the same part again. A common pain point regarding Quality Control is that once the CAD file has been converted to an .STL mesh, the tessellation makes the selection of CAD features (chamfers, planes…) impossible. 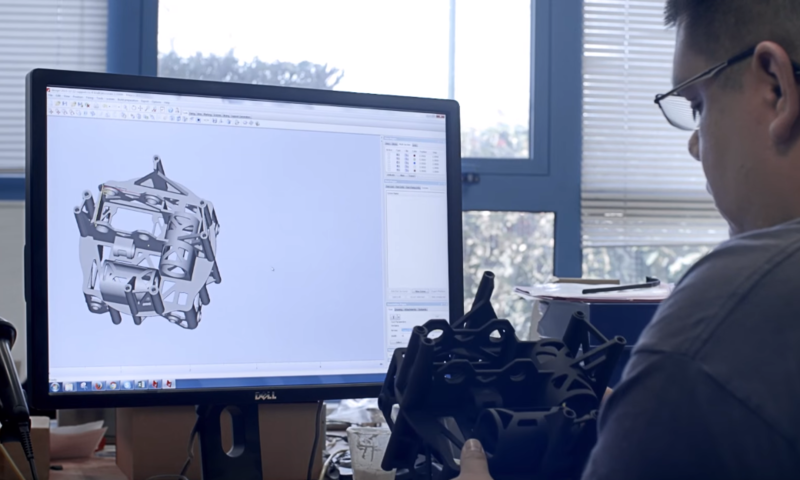 At Sculpteo we keep a living link between the CAD data and the mesh throughout production, we can preserve this valuable piece of information throughout the whole 3D printing process, including post-process. As a result, we can associate a mesh area to its corresponding CAD feature.This allows communication on issues linked to the 3D to be made naturally with reference to native features rather than triangles. PMI conveys the information related to the information necessary to manufacture the product – future mechanical constraints or tolerances for instance. The majority of CAD software editors allow their users to embed PMI in the CAD file itself. Unfortunately, most of the time this data is lost when the CAD file is converted to an .STL format for3D printing. At Sculpteo, we make the PMI data available for everyone working on the 3D – even after conversion to a tessellated mesh! For instance, it allows our operators to check that your 3D printed part matches your requirements in terms of tolerances. Working with the original data from your CAD file is important, but new information can be needed throughout the 3D printing process. For example, our 3D printing operators might need to indicate that other operators should pay particular attention to some aspect of the design, or add explanatory notes. This can be done in a visual way using our 3D annotations, allowing more fluid communication between the whole team, helping us provide you a 3D print of higher quality. Quality Control pass: The quality of the 3D print is validated, the 3D printed part can move on to the next step. Quality Control comment: The quality of the 3D print is validated for the next step, but a comment is being made for the technicians in the next stages to pay special attention to some aspects. Quality Control fail: There’s been an issue regarding your 3D print and its quality. The 3D printed part has to be rescheduled for production. Comments about the reasons for this failure are added to ensure that steps are taken to avoid it in the future. Quality Control rejection: A critical, geometric error prevents the part from being 3D printed. Most of the time, this is due to design issues, like overly fragile areas. A comment is added before adding the design to the Customer Support list for discussion on how to improve the design for production. Curious about our 3D printing service and the quality of our 3D prints? Upload your 3D model on our website now and get the best 3D printing experience! It will also be a great way to discover our various 3D printing software tools like our Repairing tools, our Optimization tools, and our Reviewing tools!